Seattle's La Luz are serious about surf rock in the best way. Sometimes with "surf rock" the first thing that comes to mind is five smiling all-American boys on the cover of Pet Sounds or any number of Beach Boys' album covers. But with that said, we shouldn't forget about the good stuff that's dark, instrumental, and takes full advantage of fun guitar effects – The Tornadoes, The Centurions, and Link Wray, just to name a few. 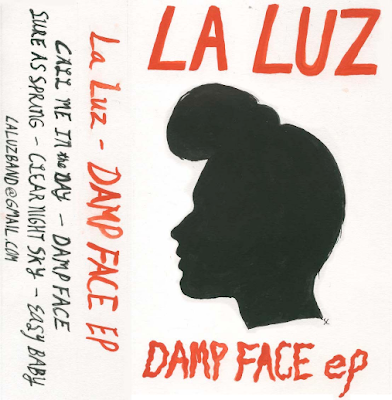 La Luz, four girls from Seattle, Washington, successfully revive serious surf rock with their debut Damp Face EP. While the band does have dreamy 60's girl group vocals, they spend more time perfecting long instrumental jam out sessions that feel like they belong on the soundtrack to John Waters' Pink Flamingoes. We typically expect surf-inspired music to come out of sunny California, but just as The Ventures did, La Luz hails from Washington state. I've never been to Seattle before but I've heard that the four-piece often plays at DIY spaces in Capitol Hill, as well as up and down the West Coast. Damp Face is a quick listen – the longest song out of five is barely over three minutes. Each song transitions seamlessly to the next and throughout the girls skillfully execute a wide range of surf styles. Songs like "Damp Face" (instrumental) and "Clear Night Sky" were sinister in a way that they made me feel like I was watching a crime movie. "Sure As Spring," a delightfully upbeat tune about a past relationship, lends a similar vibe with dark garage undertones. Whereas opening "Call Me in the Day" and last track "Easy Baby" display a sweeter side of vocal-driven surf rock. In both, slow, dreamy doo-wap vocals wash over the reverb of smoggy electric guitars. In particular, the band matches the mood of "Call Me in the Day" in their new music video and simultaneously give us a glimpse into Washington's lush forests. Listen to more La Luz on bandcamp or buy their cassette via Burger Records.